For those planning to enter Geoffrey Dyer’s book, Zona: A Book About a Film About a Journey to a Room, I’m here with advice. Before setting off to explore, pay attention to the posted signs, unless, like the hapless, eager reader I was, you simply bumble in - at your own peril. I’d been curious to read Dyer, so when I learned that his new work concerned a film that had made a great impression on me, Andrei Tarkovsky’s Stalker, the time seemed ripe to get acquainted. For those unfamiliar with Tarkovsky’s 1974 film or the 1971 novel on which it is based, Arkady and Boris Strugasky’s Roadside Picnic[i], the premise is this: some mysterious event has occurred that has resulted in the cordoning off of a “Zone” where bizarre, unpredictable and dangerous phenomena occur and that seems to possess a capacity [the “Room” in Dyer’s title] for answering one’s innermost desire. Alas, the Zone can only be accessed with the aid of an illegal “stalker” willing to lead clients around high security and through the Zone’s capricious and dangerous traps. This conceit has a quality both inevitable and ingenious, given resonant depth - as Dyer points out - by its cleverly disguised inversion of the Soviet gulag as well as by its eerily prescient anticipation of Chernobyl. Given my own appreciation of the film, I’d expected a strong reaction to Dyer’s. What blindsided me was his informal, free-associative, intensely personal style. Upon the structure of a scene-by-scene summary of Stalker, Dyer applies material gleaned from articles about the film and director, then liberally decorates his narrative with, well, apparently whatever seems to cross his mind: cultural references high and low, observations ranging from keen insights to remotely tangential asides, and a plethora of autobiographical details, from fond memories of his movie-going childhood to speculation about whether he and his spouse should acquire a dog. to address itself to one person (other than the poet himself), thus evoking overtones of love without destroying love's life-giving vulgarity, and sustaining the poet's feelings towards the poem while preventing love from distracting him into feeling about the person…this would put “the poem squarely between the poet and the person, Lucky Pierre style, and the poem [would be] correspondingly gratified. I’m don’t know whether or not - in expressing his love of Stalker – Dyer had something like this in mind, but his injection of the personal into a work that in other aspects follows the recognizable form of an empirically-based, academic treatment of its subject, certainly moves his comments about Stalker squarely between himself and the reader, running the risk – as personal revelations do (particularly when writing about innermost desires, which as Dyer notes are difficult to identify even in oneself) – of alienating readers, leaving his book the only thing in the room (my room, in which I’d been reading Zona) to feel “correspondingly gratified.” I didn’t so much dislike this strategy as find it rubbing me wrong in maddening ways that only such a personal approach could - all the more irritating for its cutting close to my own sensitivities and for my failure to watch where I was stepping. From the beginning Dyer and I got off on the wrong foot. I winced at Dyer’s occasionally leaden epiphanies (“The Zone is cinema”), name-dropping so thick it could form stalagmites, and a use of footnotes so wanton that it could out-Wallace David Foster Wallace. More to the honest point, I found (as though on a disastrous first date) many of Dyer’s tastes simply diverging from my own. He’s never seen The Wizard of Oz and asserts proudly that he feels no need to see it. He’s bored by Michelangelo Antonioni’s L’Avventura. The Coen brothers are dispatched with a blunt blow from a single adjective: “witless.” Dyer laments the loss of a treasured shoulder bag, a brand I’ve always disliked for its almost fascistic aesthetic. Dyer rhapsodizes over the Burning Man festival and over dogs; as a San Francisco resident, I’m peeved by the rampant fetishism of both. 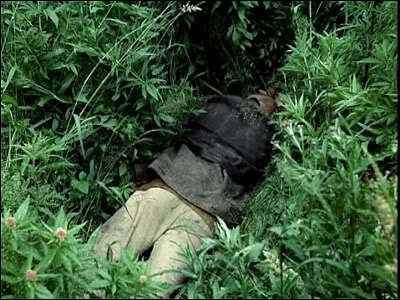 Even concerning Stalker, I found – despite Dyer’s many fine observations – elements I love about the film that Dyer neglects or even fails to mention (one trivial example: the flora of the Zone in which the stalker takes a nap appears, in a blunt Tarkovskian witticism, to be a field of marijuana). How maddening for our egos, when a critic doesn’t appreciate the things we ourselves appreciate! But given the ample warnings that a more careful reader might have heeded before rushing into Zona, my complaints are but those of a bumbling tourist, one who, focused on seeing the Eiffel Tower, fails to appreciate the Grand Palais. After all, the title clearly promises more than merely “A Book About a Film” (and, with its string of prepositions, suggests an unreliable distancing from its real subject in the way that “my friend’s best friend’s sister’s boyfriend’s uncle” does). Two epigraphs preface Zona, one from Albert Camus that almost screams an admonition - “After all, the best way of talking about what you love is to speak of it lightly” - and the other referencing the blindness that can occur from looking at something too intently. Readers might also skip ahead to the closing epigraph from novelist David Markham: “Or was it possibly nothing more than a fundamentally recognizable genre all the while, no matter what Writer averred? Nothing more than a read?” This coy apologia (with its nails-on-chalkboard use of “read” as a noun) comes too late, though there’s a more contrite, less expedient one in Zona where in a sudden self-interrogation Dyer addresses whether this hyper-personalized approach is even to his own taste, much less the reader’s. Here Dyer makes clear that he’s not so much condoning what he’s doing as running with it. Zona is a running, passionate appreciation of Tarkovsky’s film, but it’s even more an unfiltered experience of falling in love with a work of art, writing about it, and playing with writing about it and with the modes of writing about a work of art (after all, one of the stalker’s clients in the film is simply “Writer,” with an ego that invites problems in the Zone). I mean, some of these elements that so grated on me are just jokes, right? When Dyer deadpans that his own innermost desire might be for a three-way with two women, might he also be implying that perhaps the truest desire of the writer is simply to bring one’s personality into art, rather than submit to the constraints of trying to hide it? To admit one’s whole flawed being in responding to and writing about art, rather than adopt a dry voice of impersonal authority? To exaggeratedly use the candor of the personal to create a form that manifests the unavoidability of the personal? And to parody, simultaneously, both the impersonality of academic responses to works of art and the often overly personal ones of increasingly powerful popular opinion made possible by the Internet (for example, in, um, blogs run by amateurs, like this one) and, by this strange dialectic, come up with some new synthetic form? Perhaps. If so, Dyer may have found his room. There’s a suggestion in Stalker, highlighted in Zona, that the “room” in the film, though, may simply be the bar where the stalker meets his clients prior to and following their Zone visit - that in fact they’ve never left the bar. It’s an appealing interpretation, one that helped me put aside my almost exclusively personal annoyance with Zona and think of it more like an animated, intellectually stimulating, slightly tipsy conversation in a pub with an animated, intellectually stimulating, slightly tipsy stranger. I can’t say I’m unhappy to have encountered him. I’m grateful for his meandering and insightful talk about a film we both admire. And the setting is surely more convivial than a stuffy lecture hall. But I could use another drink. Dyer can pay for this round. [i] Amateur Reader’s post on Roadside Picnic this week convinced me to dust off and try to salvage this previously abandoned post on Geoffrey Dyer’s book. I've somehow suspected for a while now I wouldn't like Dyer (your description makes him sound like Slavoj Zizek: "then liberally decorates his narrative with, well, apparently whatever seems to cross his mind: cultural references high and low"). I do like Stalker as well (the only Tarkovsky I get on with), so may be best to steer clear. The relationship between Stalker and Roadside Picnic, sounds very similar to the relationship between Solaris and Solaris: and for the very same reasons, Solaris is of course much more interesting than Solaris. If you like Stalker you might also like The Sacrifice. It's like a reverse of Ray Bradbury’s story “The Sound of Thunder" in which an action in the past changes the future for the worse. In The Sacrifice an action in the future changes the past for the better. I bought this because I was once a huge Tarkovsky fan and liked Dyer's short story collection "But Beautiful" a lot. The moment I got it I thought "Hmm, maybe not entirely what I have expected" but I would really need to start reading properly before making and real statement. As a presmise it's interesting but it's odd he totally left out the book. I haven't read it, only know Tarvovsky took major liberties, still, I would have suposed he would write something about this. My memory of the movie is quite blurred by now. Maybe I don't need to re-watch it to read this. Dyer didn't strike me before as being prone to excessive navel-gazing but now...I'm not so sure. It is so nice to see that my dubious efforts have such positive results. A fine salvage job. How fictional does the "Dyer" of the book strike you? I have not read him, but reading about him I have picked up the idea that his books are all novels, sometimes in disguise. Yes and yes and yes and maybe. I like Tarkovsky a lot - maybe especially Stalker but Andrei Rublev is unforgettable, Solaris (his version, not the George Clooney one) is great, and I like that idea of The Sacrifice being the Ray Bradbury story in reverse. To Tom's point, I can't help but think that Dyer is really pulling our leg - to write, for example, about the translation from B&W to color in The Wizard of Oz and then say it's a film he doesn't ever need to see - it's not really plausible for someone with an ounce of curiosity to write that, and I got the sense throughout Zona that his real subject is not even Stalker but the forms that criticism takes. So yes, maybe Zona is a novel. He's certainly doing something quite interesting here, not quite what it seems to be on the surface. In any case I sincerely hope that he's playing with us, for if not, then Zona is too clever by half, and not clever enough by the other half. Dyer: Yeah, you know, it’s one of the unfortunate things about this layer to the book is any change that I make has a huge knock-on effect because there are no chapters. That was one of those. At the end of that note on The Wizard of Oz I say I’ve never seen it and I’m not going to. It was one of these things… Sometimes one’s professions of ignorance are in themselves illuminating, and that seems to me to be, well, that was just stupid. And several people have pounced on that, and I’ve realized, yeah, they’re right to have done that because it was foolish, but I can’t do anything about it. Normally, with a more traditionally organized book, you can cut things. But that idiotic remark, which has served no purpose other than to irritate people, is stuck there. Umbagollah - Many thanks for this link. After reading the interview, I feel even further distanced from Dyer, at least as far as taste is concerned. I mean really, how can anyone hate Pedro Almodóvar, a famously generous director magnanimous enough, for example, to let Caetano Veloso just do his thing uninterrupted? I can't make any sense of Dyer's excuse about the Wizard of Oz reference and how altering it would have had a "huge knock-on effect" on the rest of the book. Finally, I don't think that "profession of ignorance" is quite the right term for what that was. Anyway, yes, see the film. Funny, the title immediately made me think of Xavier de Maistre's Journey Round my Room. Wow, Miguel, thanks! I'm honored! What delightful news (and delivered delightfully too, I should add). I only hope that in future posts I can actually try to merit the award. Thanks again. Hi, I came over from Andrew Blackman's site, and got caught up in this fascinating post. I read Dyer's book on D.H. Lawrence and whilst I admired the rambling-yet-coherent voice, I was also distanced from the narrator by his tastes and opinions, not least the ferocious rant he directs against academics (I used to be one). After years of schooling myself to respond to narrators with neutrality, weighing their tastes but feeling in no way involved in them, it was strange to feel so personally attacked by Dyer at that point. I would love to think that this is some clever persona he creates, but I don't think that's so. He writes from his undigested beta elements, hence his ability to shock and offend is never smoothed over by art. I admired the book enough, however, to offer it to my husband to try. He is an arch procrastinator so I thought he'd appreciate a book by a man doing his best to avoid the work of writing a book. In fact, it was all too much and my husband abandoned the book after about 30 pages, unable to take this mirroring of his own worst habits. Maybe this is just Dyer's speciality, an uncanny ability to unsettle and disturb the reader through his ambling, supposedly pointless monologue. Maybe he is a kind of anti-sympathetic narrator, who arouses the sharpest of antipathies in the reader at times, rather than the cosiness of identification. Hmm, I'm just speculating here, but it's intriguing the reactions he provokes. Litlove - I'm not going to have an easy time forgetting "He writes from his undigested beta elements"! I do, though, very much like your "anti-sympathetic narrator" theory; whatever else one may say of Dyer, he's provocative, and he's doing some clever, if befuddling, things with criticism. I should really read something else by him - if I can ever again find the patience. Okay, I just stumbled upon another fascinating post after spotting the Strugasky brothers on your list of labels. I don't think Dyer's book is for me (well, fictional or not, the author is bored by L'Avventura - enough said). Roadside Picnic, however, is another book that has been sitting on one of my wishlists for several months. Max recommended it to me a while back, and it sounds as though you liked it too (despite your reservations about its faults). It came up in the conversation when I reviewed Hamid Ismailov's The Dead Lake, which features The Zone - a hazardous nuclear test site in the Kazakh Steppe region. Max though it must be a reference to Roadside Picnic. There's a link to my review here if it's of any interest. I liked the Ismailov very much - a haunting story, beautifully written. Back to films, my memories of Stalker are a little fuzzy now, but I recall it being strange and fascinating and elusive. Another one to re-watch soon. I'm very curious about Tom's comment above, that Dyer's books are "novels" of a sort. He says so many deliberately provocative things in this book that I can't help but believe (or hope to believe) that it's all kind of a put on. And perhaps his rescinding his barbed comment about The Wizard of Oz is also a kind of put on. He was here recently giving a talk; I'm sorry I missed it, as I would have liked to ask him about this (knowing that his response could be a put on as well). I just checked out your Ismailov review; it seems nearly impossible that the author isn't deliberately evoking the Tarkovsky film (and perhaps the Strugatskys' book as well, which I indeed like very, very much and have read several times).